Solid superionic conducting material replaces traditional liquid electrolyte and creates a strong ionic bridge between cathode and anode. This results improved safety, increased power density, extended degeneration time, and temperature stability. On the con side they can be costly to produce and have poor interface impedences, cycle stability and rate capability. Research is being done with cubic and tetragonal lithium lanthanum zirconium oxides LLZO. A solid electrolyte is polished and pressed in intimate contact with the active electrode materials. RTIL’s are a powerful solvent with conductive properties, that could reduce instability in rechargeable lithium metal batteries. Lithium metal is a very volatile metal, and some of the problems that RTILs are being approached for include irregular plating deposits and a favorable Solid Electrolyte Interphase SEI. 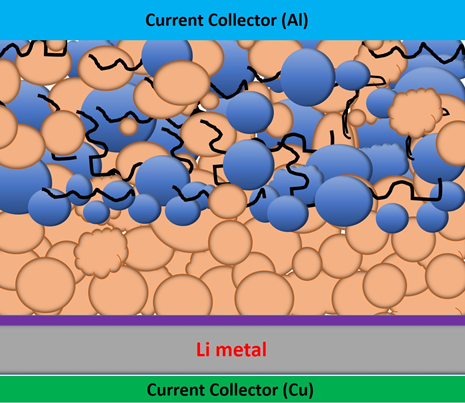 Irregular plating is an issue limiting cycle life of secondary lithium metal batteries. Theses irregularities become nucleation sites that form ‘lithium whiskers’. At their worst, these pierce through the membrane layer separating the cathodic from the anode cell causing violent shorts. RTILs have shown promise reducing their growth tendencies. An SEI is the natural formation of lithium and electrolyte created on the surface of the electrode. This layer passivates some of the reactions over the electrode surface by being chemically different than the electrode material. SEI layers using RTILs are helpfully permeable, allowing Li+ transport while only reducing capacity slightly. They also help reduce the metals irregular growth by quickly forming a homogenous layer. Ionic liquids are non aqueous conducting fluids that can remain stable at higher temperatures then traditional electrolytes.